Please enter name (maximum of 14 letters) in the personalization box.If you do not wish to have the item personalized, type "None" in the box. Large Engravable Cheerleader Photo Album. Empty those shoe boxes into these velveteen backed books. Each is engraved with "CHEERLEADER" down the right front. You choose the name to be engraved across the top. 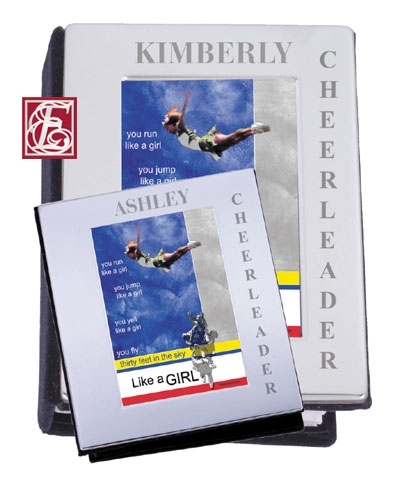 6.5"x5.75" with a 4"x6" photo frame on the front and holds up to 100 4x6 photos (50 pages). One line, 14 characters. CHROME FINISH. Just give your name and we will do the rest.